There’s more to Monster Hunter than its name suggests. Yes, you’ll hunt fantastical beasts with rudimentary weapons and armour so that you can craft better gear from their remains. And sure, that improved loadout helps you hunt bigger and meaner creatures whose hides make better gear… ad infinitum. But look up from the inventory screen and into the world, and you’ll see a wonderfully realised ecosystem of bizarre flora and fauna. One that feels like it operates totally independently of you and your sword-swishes, and whose circle of life could continue into infinity. 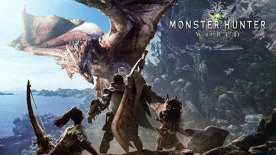 Hunt alone or in co-op with up to three other players, master your surroundings, and hunt down 31 large monsters and 17 smaller monsters, the majority of them new to the series. Each has their own pattern of behaviour, from feeding preferences to combat stances and attack patterns, so tracking is as important as fighting if you want a successful hunt. Monster Hunter World’s weapons and armour crafting system goes deep. Like, really deep. Low-level materials like leather and chainmail might be sufficient to bag your first kills, but before long you’re embarking on multiple quests to gather the required pieces for a Pukei armour set, and mastering the Glaive’s aerial advantages. Part natural world simulator, part RPG and management game, Monster Hunter’s earned a lofty reputation across countless console outings - and now as it nears PC release, Monster Hunter World offers the series high point as an introduction for PC gamers.